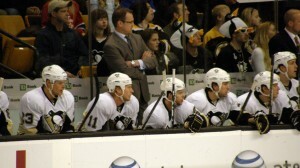 Ray Shero's Pittsburgh Penguins: Ready for Another Stanley Cup Run? Ray Shero’s Pittsburgh Penguins: Ready for Another Stanley Cup Run? When Ray Shero first arrived on the scene from the Nashville Predators, he brought a hockey mindset of toughness and grit to the Pittsburgh Penguins. He signed players who brought their hard hat and lunch pail to the rink on a nightly basis. In Shero’s 1st year as general manager of the Penguins, he signed Jarkko Ruutu and Mark Eaton. He also acquired Gary Roberts and Georges Laraque. These were players who did not have much flash, but did have workman-like attitudes. This was Shero’s brand for success as he turned a Penguins team around that had not made the playoffs in the prior four seasons leading up to his arrival as general manager. He was not interested in stockpiling 40-goal scorers because he knew that he had that kind of talent in players like Evgeni Malkin and Sidney Crosby. Shero’s goal was to create a well-balanced hockey club which was very difficult to play against every single game. Shero brought in veteran players who contributed in different but very important ways to the Penguins. Once Shero got ahold of the Penguins they had veteran leadership in their locker room. They had gritty players who played a physical brand of hockey. Shero realized that the Penguins needed balance at both ends of the ice. He brought in shutdown defensemen like Hal Gill. Shero also found character players like Bill Guerin and Petr Sykora. None of these players were in their prime or known as the most talented hockey players in the league, but they filled roles on the Penguins which made the team stronger as a unit. Since the Penguins won their 3rd Stanley Cup in franchise history, the balance has been swinging on a pendulum. Two seasons ago, the Penguins were one of the best defensive hockey teams in the NHL, but lacked scoring due to injuries. Last season, they were the highest goal-scoring hockey club in the league, but struggled mightily down the stretch at the defensive end of the rink. The Philadelphia Flyers proved in the 1st round of the Stanley Cup Playoffs that they were a better hockey club than the Penguins. The Penguins’ weaknesses were exposed. “They (Flyers) played a terrific series and proved that they were a better team. 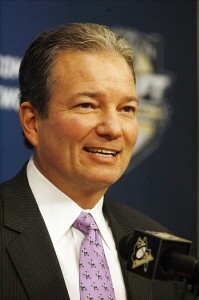 188 days of the regular season went down and kind of unraveled for us in 10 days,” said Shero. The Penguins gave up 30 goals in six games against the Flyers. Shero should have made defense an immediate off-season priority. Instead of going after Zach Parise harder than anyone else on the free agent market, Shero should have been searching for a different type of player. The Penguins showed that they lack defensemen who were gritty and play a shutdown in-your-face style of defense, and veterans who were willing to sacrifice their body to win. Over the last few years, the Penguins have seen a lot of their character players leave like Arron Asham and Mike Rupp. In addition to these departures, they are also missing an influential veteran presence in their locker room despite the fact that core players like Crosby and Malkin have been in the league for quite a few years now. Shero’s managing principles have seemed to change. He has focused his efforts on finding the most talented players on the market instead of searching for the key ingredients that make up a well-balanced hockey team. It’s no secret that Head Coach Dan Bylsma wants the Penguins to play a north and south style of hockey. Bylsma wants the puck moving forward in the opposing team’s defensive zone as much as possible and he wants puck possession. Other the hand, no matter how skilled the Penguins look on paper at both ends of the ice, they are not always going to own possession of the puck. They need to fill huge holes that were exposed towards the end of the 2011-12 season when they could not keep the puck out of their net, especially in the playoffs. The Penguins do have a surplus of young defensemen, but how many of these so-called talented defensemen have proven themselves in the NHL? None of them. Many of them have spent time at the NHL level, but none of them have played an entire season. “We like our defense the way that it is. If there is a chance to upgrade, we certainly are going to do that. We’ll go with what we have at this point, and the same thing up front,” said Shero. This should be a major concern for the Penguins. They need a couple of defensemen who may not move the puck with ease but will stop Alex Ovechkin every single time he has a 1-on-1 opportunity. They also need players who are willing to block shots and sacrifice their body in front of a Zdeno Chara slap shot. They need players who are difficult to play against. Although the Penguins won 51 games in the regular season, they were 15th in the league in goals against. Although Shero may disagree, the Penguins were too easy to play against in their defensive end. “I don’t think we were easy to play against. Physically we played the game the right way (and) defended the right way,” said Shero. Shero has also stated that the Penguins have a team goal every season to surrender less than 200 goals. This past season, the Penguins did not reach their defensive team goal. They surrendered 218 goals. Defense needs to be more of a focus by Shero and he needs to find defensive improvements at both ends of the ice going into this season. If the Penguins weren’t easy to play against and defended the correct way, they would not have given up 30 goals in six playoff games when goals are supposed to be more difficult to score than the regular season. Whether the coaching mentality of Bylsma has influenced Shero’s managing philosophy, we will never know, but Shero has been chasing a different type of player over the past few years. Shero needs to adopt his old philosophy and find more character players who fill specific roles on the Penguins. The Penguins already have enough pure talent on their roster to win a Stanley Cup. They scored enough goals to beat the Flyers in the 1st round of the playoffs but could not keep enough rubber out of their own net. Evidence has shown that talent alone will never win a Cup in this era of hockey. Since Byslma won the Stanley Cup in his inaugural season, his plan to all out attack has worked in the regular season but has not been very successful in the playoffs when every team puts on the defensive clamps. This attacking style preached by Bylsma has seemed to influence Shero into bringing in players who only want to play an offensive style and lack a defensive presence. The Penguins do not need all goal scorers and they do not need all puck moving defenseman. They need a balance at both ends of the ice which consists of physical shutdown defense and a physical fore-check. The burden should not solely rest on the defense either. They need forwards who are willing to block shots and fill roles besides trying to score goals. If Shero does not develop a well-balanced hockey team this coming season the Penguins will disappoint like they have since their Stanley Cup run in 2009. Opposing teams need to hate to play against the Penguins. Right now, they have the goal scoring talent, but they need to become tougher and better defensively. They do not need to be searching for anymore scoring talent. Shero needs to fill the Penguins roster with unselfish character guys who are willing to sacrifice goal scoring stats to win hockey games.